Did you know that your old water heater can cost you money month after month? When it comes to heating water, efficiency counts. With and old tank, heating water could be the cause of 25% of your energy bill. By simply replacing your old water heater tank you could reduce that number to as low as 16%. Wow, that will end being a lot of savings of the years! Is there an expansion tank installed? Is your tank earthquake strapped? Does your tank sit in a pan or is your T&P piped to a drain? Is the gas line installed with a double wall flexible pipe? Gas water heaters are the most common, affordable, easy to replace and dependable. One of the models we recommend is built by Rheem. Electric water heaters are convenient to install when there is no gas available or when running a flu would be difficult. 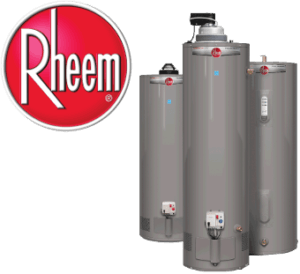 Though the installation is cheaper for electric, the cost of running an electric water heater is higher than a gas water heater by Rheem. Tankless water heaters add a luxurious bathing experience with endless hot water. The efficiency is substantially higher than standard tank systems. This type of water heater mounts on the wall and also saves space. It’s important to remember to place your new tankless system as close to the point of use as possible for the best results. Do not assume you will be installing a tankless water heater in the location where old tank was. Tankless water heaters come in indoor and outdoor models. This system is the most efficient but the most costly to install. This system is still dependant upon gas or electricity if solar is unavailable. Here in the Salt Lake Valley, where we tend to have a lot of water usage with larger families, your water heater can be taking a beating. It can also be costing you more money every year if the water heater is older and not as energy efficient as the newer models. Here at Keemer Plumbing, we have many water heating solutions that will lower your energy usages resulting in a lower utility bills. Give us a call or send us an email for a free estimate. We service Kearns, West Valley, the Salt Lake City UT metro areas of the Wasatch Front! Feel free to contact us ASAP, thank you!